One pest will invariably occur if provision isn’t made to deal with it. This is cutworm. 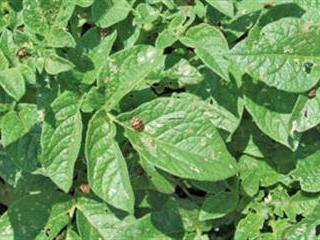 Potato ladybirds can do much damage in a short time as they may come in swarms. When crops are planted in spring after the land has been left unplanted in winter, farmers generally believe the land should be free of cutworm. But these hardy creatures – which aren’t worms, but are, in fact, caterpillars – can survive on rotting vegetation while waiting for you to plant potatoes! While inspecting a fallow land for weeds also look for signs of cutworm activity. Although they can survive on debris, they prefer anything green. If there are no signs of activity among the weeds, cutworm won’t be a problem at this stage. If there’s any doubt (if, for example, there aren’t enough weeds to determine cutworm presence) apply a pyrethroid spray over the land after planting. 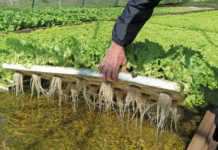 This can be done the same time a herbicide is sprayed, if one is to be used. The hazard isn’t over, however. When the crop is growing and weeds germinate, cutworm moths often lay their eggs on these weeds. 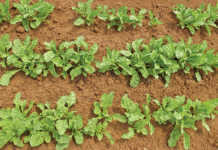 The weeds are then destroyed by ridging or by herbicides, but the tough little critters will survive on the debris and then start tackling the lower leaves of the crop which touch the soil. Unless you specifically look for this, it will carry on unnoticed. The caterpillars thenstart chewing through the stems. This activity is also not readily seen, unless you walk through the land, checking the stems. Cutworms may also develop later and attack the tubers, and this is only noticed at lifting. The rule, then, is regular inspections for cutworms! The potato ladybird can do a lot of damage very quickly, and is always a threat in some areas. 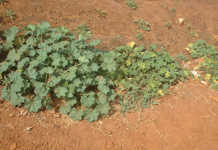 This species has turned vegetarian and lives off a number of crops and weeds. In winter, the mature ladybirds migrate to sheltered spots, such as the crevices in rough bark trees. After the first summer rains they take to the air and look for host crops. They invade in large numbers and, as noted, do substantial damage in a very short time. They lay clusters of yellow eggs on the underside of leaves and their scary-looking spiny larvae continue where their parents left off. Many products easily control this pest, but many also kill off the beneficial insects which keep other potato pests under control. I’ve found the insecticide Larvin to be effective without doing too much damage to beneficials. It may not last as long as pyrethroids, but at least it doesn’t cause a flare up of another pest. Another major pest is the leaf miner. This small fly lays its eggs into leaves. The larvae then make serpentine tunnels through the leaves. The flies also puncture the leaves with their ovipositors to make wounds and feed on the sap. These feeding lesions are more widespread than the punctures made for egg laying. Apart from the physical damage, all this activity makes it easier for leaf diseases to take hold. when you find leaf miner tunnels. If there are none to be seen and plenty of leaf miner flies, which are recognised by a yellow dot on the thorax, then you may have to use an insecticide. Be careful when selecting such a product as you need to suppress the flies and preserve the wasps. In fact, it’s very difficult to effectively control the flies chemically without help from the wasps. It is worth discussing the correct strategy with a pest control representative who deals with biological products. Contact Bill Kerr at [email protected]. Please state ‘Vegetable production’ in the subject line of your email.